As we continued our Puerto Vallarta Food Tour towards the city’s waterfront we stopped at Tacos El Cuñado (which literally means “brother-in-law”), another family owned operation that has been in business since 1968. There is no brother-in-law here, but only two young brothers who are the sons of the original owner. Ricardo pointed out that this is the top “carne asada” stand in town. “Carne asada” literally means “grilled meat, and is usually thin marinated beef. As I don’t eat red meat I got to sample a tasty quesadilla instead which was scrumptious. Several sauces were available as condiments that went all the way from mild to fiery hot habanero sauce. Francisco Rodriguez Street leads directly to the Malecón and to one of Puerto Vallarta’s newest attractions: the Pier on Playa Los Muertos. 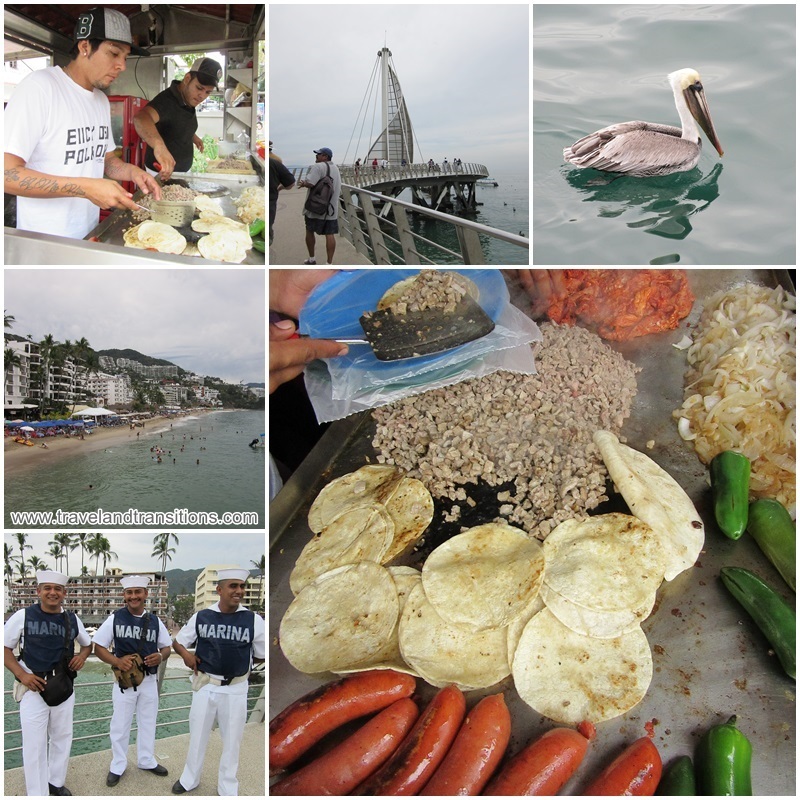 This pier was inaugurated in January of 2013 as part of Puerto Vallarta’s ambitious downtown renewal program. Since then, this modern structure has become one of the must-see attractions in the city. From the pier we had an outstanding view of the entire Bay of Banderas, and Ricardo explained all the different towns and villages of the bay to us, from Punta de Mita and Bucerias in the north to Nuevo Vallarta, the airport and marina areas to the Hotel Zone and downtown Puerto Vallarta. Looking south, the Pacific coast features the former fishing villages of Mismaloya and Boca de Tomatlán as well as the three famous rocks called Los Arcos. Farther south along the coast and out of view were Las Animas, Quimixto and Jelapa, which can be reached by water taxi. From the pier we started heading north along the Malecón, and our food expert Ricardo mentioned that before the big tourist boom, a day on the beach in Puerto Vallarta involved a hammock and a grilled red snapper. Today, there are numerous waterfront restaurants north and south of the pier that entice visitors with seafood and other specialties to come in for a visit. 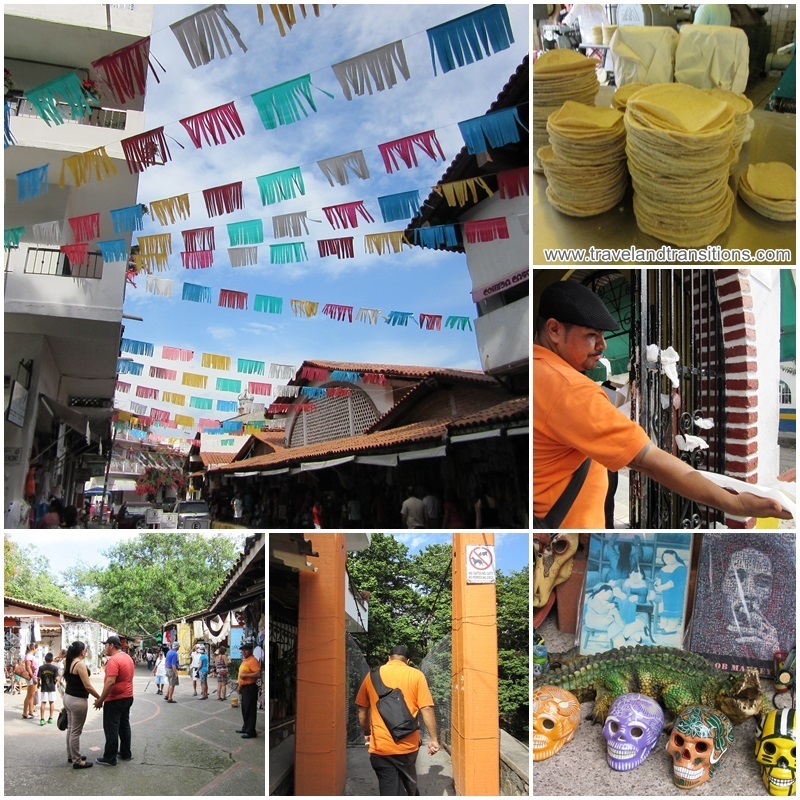 To put Puerto Vallarta into a historical context, Ricardo explained that Puerto Vallarta was originally called Puerto Los Peñas de Santa Maria de Guadalupe and was later renamed after Ignacio Luis Vallarta, a popular governor of Jalisco in the 1800s. He also gave us three different versions of how the name “Playa Los Muertos” (“Dead Men’s Beach) could have come about; they either involve fights between the Spanish and local Indians or pirates with dead men strewn all over the beach; or the name could also be attributed to an Indian burial ground for the local Huichol tribe. Then we started walking inland from the waterfront past Parque Lazaro Cardenas, the square where the “Tianguis Cultural” / the Old Town’s Farmers Market is held every Saturday. We quickly popped into “A Page in the Sun”, a café that also serves up a large collection of books for more than 20 years. Walking farther east we arrived at Cesar’s Coconut Stand on Aquiles Serdan Street and watched the owner as he beheaded countless coconuts with a machete, collected the coconut water and carved out the white coconut meat. Coconut water is one of the healthiest drinks that provides great hydration for the body and is said to have anti-viral, anti-fungal and anti-microbial properties. Cesar has been in business since 1984 and sells more than 900 coconuts a week. Not far away, at Francisco I. Madero, we made a stop at Cevicheria El Guero, a seafood restaurant that has been operated by a husband and wife team since 1989. 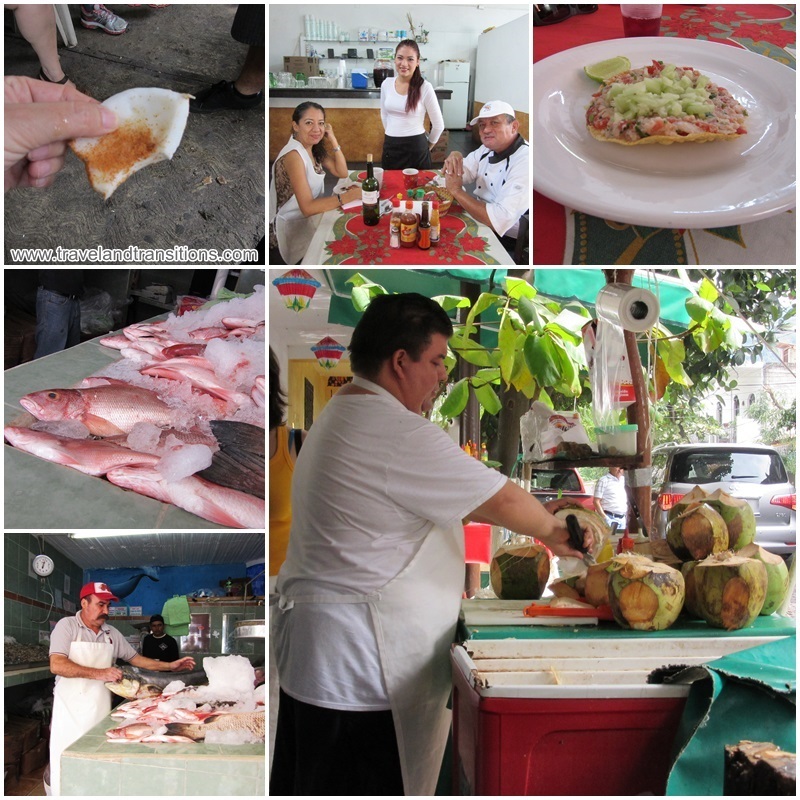 Its most renowned dish is the ceviche which is made of fresh red snapper fillets. Everyone got to taste a freshly made ceviche tostada, accompanied by a glass of Jamaica, a delicious drink made of hibiscus flowers. Many members of our group considered the ceviche here to be their favourite. At the El Guero fish shop across the street, the fishmonger held up a huge piece of fish for us. Quite likely this might be the place where El Guero gets its fresh seafood ingredients. Around the corner, at Tortilleria La Gloria on Calle 5 de Febrero, we got to watch how Mexico’s staple food is produced. Tortillas,whether they are made from corn or wheat flower, are ubiquitous in Mexico. Many families go through dozens of tortillas in one sitting. We also learned how to roll and cool off a tortilla before getting a chance to taste a freshly made one that was still hot, so we had to toss it back and forth to cool it down. Now more than 40 years in business, Tortilleria La Gloria is Puerto Vallarta’s oldest and busiest tortilla factory. After the torilla factory we crossed the Cuale River. Next on our itinerary was crossing the bridge over the River Cuale to get to the north part of town. Isla Cuale is an island in the middle of the river whose western portion has been turned into an outdoor arts and crafts market. The way you get onto the island is by wooden swing bridges that sway considerable from side to side if anyone on the bridge makes a mis-step. Naturally, we had one or two hams in our group that made the bridge swing intentionally; they just couldn’t help themselves. 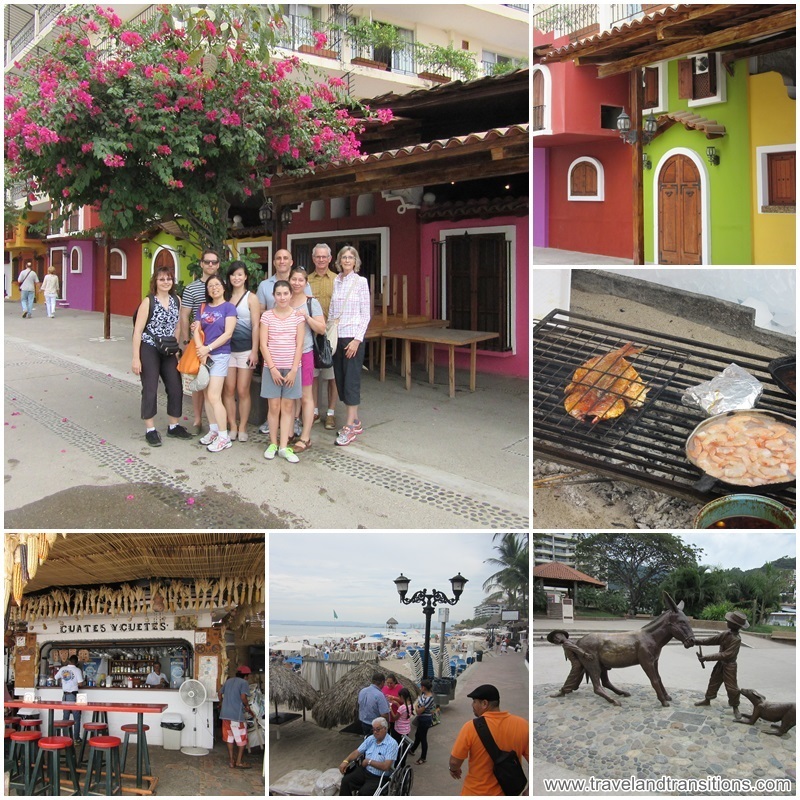 Now it was time to check out Colonia El Centro, the city centre north of the island.